In response to its growing urbanization, China is reinventing the “garden city” concept in order to create space for both its urban and its displaced rural citizens. Every year, more than 15 million people move from the countryside to the cities. By 2025, China is expected to have 400 million more people living in its cities. To feed the world’s largest population, China will have to explore novel ways of food production. 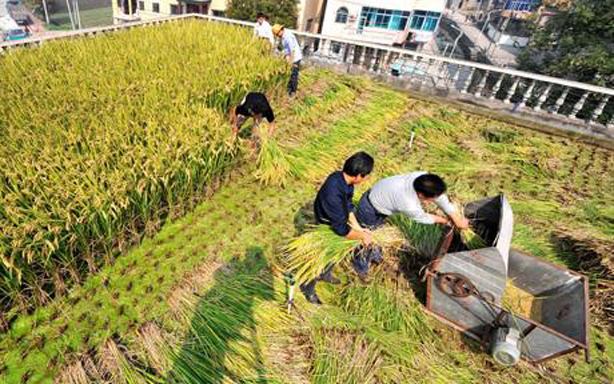 Harvesting rice on a 120-square-meter rooftop paddy. Photo: Feature China/Barcroft Media. As displaced rural communities are forced into the cities, urban planners have begun to analyze an emerging trend, the merging of country and city by preserving patches of space to be used as productive farmland within urban boundaries. 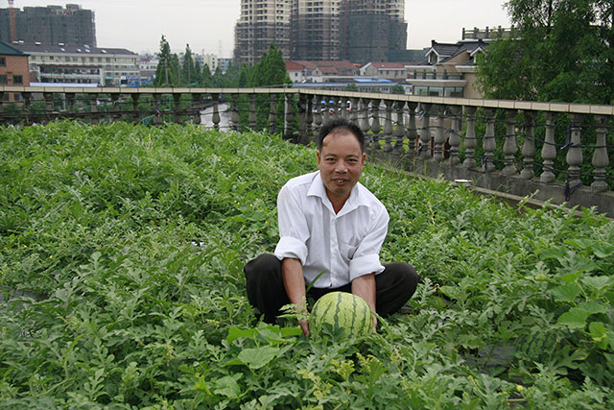 On his rooftop, Peng Qiugen has grown as much as 400kg of watermelon which he sells at the local market. 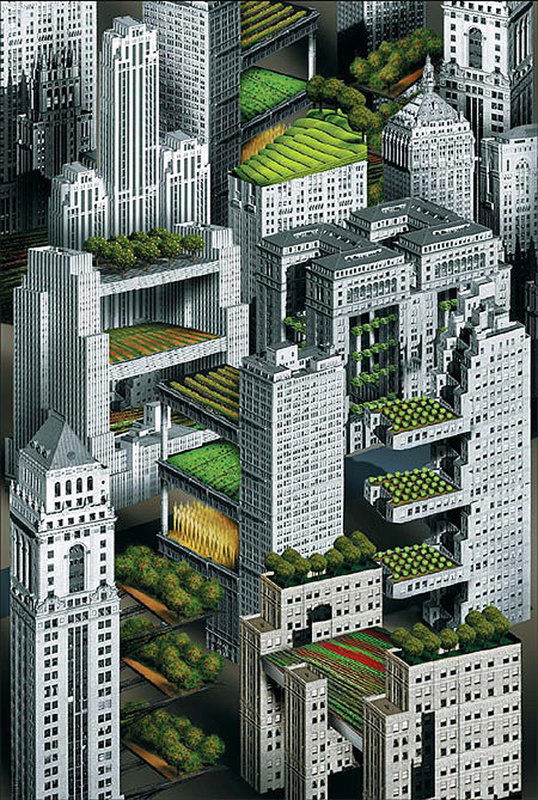 Via livingrooftops.org. The model could bring back work and purpose for displaced farmers, but also reduce food miles, meaning access to more fresh agricultural products at lower costs and a decrease in carbon emissons. As a bonus, urban farmland could also be showcased for “agrotourism” and used for education. Trend-setting urban farmer. Zhang Yanlin for China Daily. At the grassroots level, the concept is already in practice. 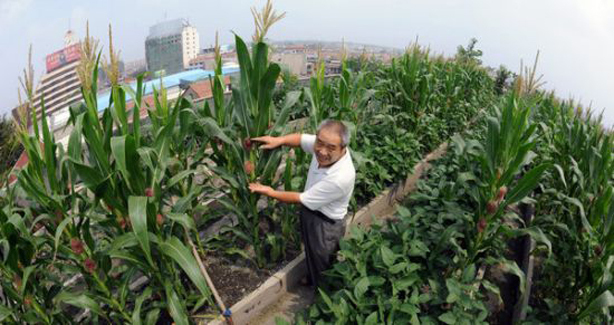 Zhang Guichun, a 55-year old Beijinger, farms an organic “hanging garden” on the roof of his traditional courtyard home north of Tian Tan in southern Beijing. 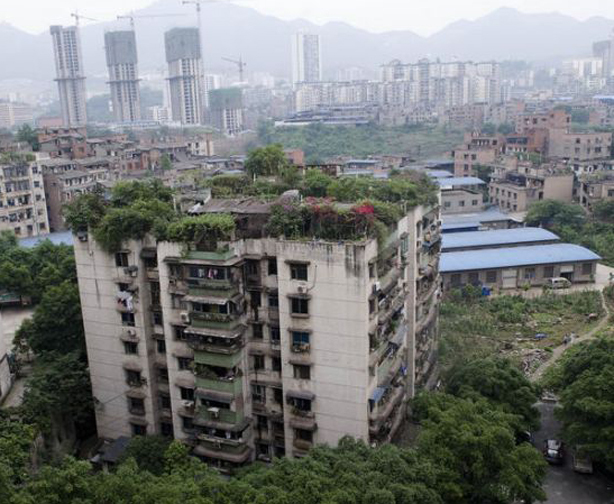 “Even if we don’t have enough land in the city, agriculture can go vertical, up to roof and balcony,” Zhang notes. Zhang, who practices traditional Chinese medicine, began cultivating his hanging garden five years ago and now grows about 3o varieties of vegetables and fruits, including tomatoes, cucumbers, sweet bell peppers, and melons, and now harvests enough to feed his entire family. Planting on the rooftop like this apartment in Chongqing. Photo by Xinhua. In addition to supplying his family with safe and nutritious food, Zhang’s vertical rooftop farm offers many other tangible benefits. The garden keeps his home cooler in the summer, reduces the number of mosquitoes as tomatoes are natural insect repellents, and he has cultivated more than veggies: he has bonded with neighbors.